If you have read any of my articles, I tend to concentrate a lot on organization within my office cubicle. Well, these two really novel office items from the Desktop Madness Series, not only boosted my office organization but they also have greatly increased my cubicle décor and office ambience! Hey, we all need some fun in our offices every now and then and I just happened to find products that add fun but also practicality. The two items that you see above, the Desktop Madness Hand Cell Phone Holder and the Desktop Madness Stop Hand Bookends are really quite novel items that I bought as a matching set for my office cubicle. The Desktop Madness Series includes a number of other novel desktop items but I thought that this matching pair wouldn't take up too much space in my office and would still add to my cubicle decor. You may also remember my cell phone holder that hangs on my cubicle wall that I wrote about in this article. Check out my YouTube Video below of the Desktop Madness Hand Cell Phone Holder from just receiving it in the mail to using it in my office cubicle. It also makes an ideal paperweight. A great gift for the office worker. Perfect for enhancing your cubicle decor! 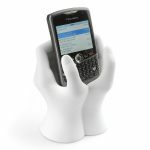 If you have an interest in a unique cell phone holder for your office this Desktop Madness Hand Cell Phone Holder is a really unique and solid cubicle accessory. It will not only boost your cubicle decor but it will also add a practical accessory to your office. The next Desktop Madness Series office accessory that I picked up for my cubicle is called Stop Hands Book Ends. They are so lifelike it's obvious that they modeled them after actual hands. It was rather strange even handling these book ends! 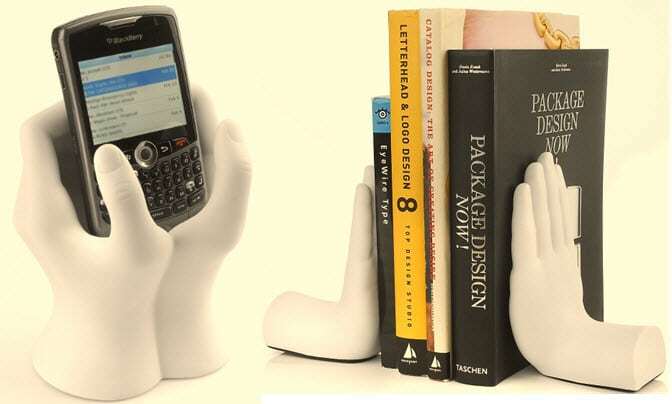 I decided to buy these book ends because they matched the Desktop Madness Hand Cell Phone Holder perfectly and I liked having the matching set. You wouldn't believe all of the comments I get from my coworkers! I created another YouTube video for this unique office item as well that you can view below. Ideal for desktop or bookcase. It is the perfect gift for the office worker. Great for boosting your cubicle decor! If you want to impress your coworkers with some really cool cubicle accessories that will add to your cubicle decor, these Desktop Madness Stop Hands Book Ends will make a really nice addition to your working environment. Practicality and decor upgrades at the same time. You can check out all of the other Desktop Madness Series items by clicking here if you like their style. I certainly do and I think you might as well. Any questions please either leave them in the comments or use my Contact Me page. 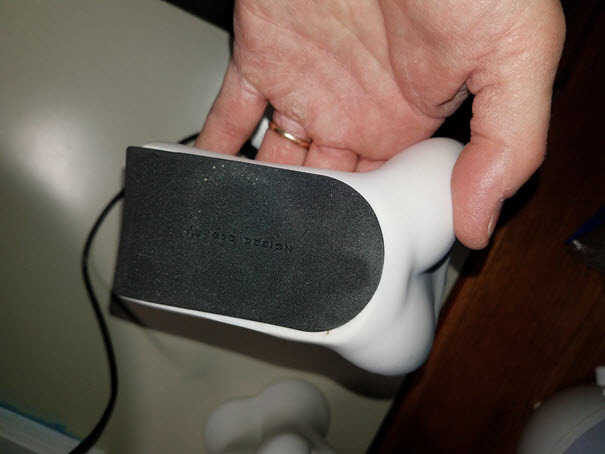 Are the hand bookends rubberized underneath to prevent scratching surfaces? Thanks. That’s a really good question! Yes, they are and I am including an image of the bottom. It is a rubber-like material to prevent scratching. I’m going to update the article with this information. Thanks! Here was the image I attached. Also, the bookends and the cell phone holder have the same rubberized material on the bottom to prevent scratching surfaces. Rubberized bottom to prevent scratching.